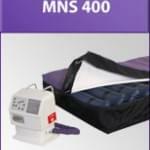 The MNS 400 Pressure Relief system is designed for long term care and home settings. Its alternating pressure relief system or Genuine Low Air Loss system gently massages the epidermis while continually changing contact points with the skin's surface helping to eliminate the development of and provide easy and effective treatment for pressure ulcers. The Genadyne MNS 400 is a full-depth (8") powered alternating pressure air mattress replacement system which reduces interface pressure for the treatment of stage I to Stage IV pressure ulcers. The MNS 400 reduces interface pressures below capillary closure by alternating pressure in the 8-inch air cell bladders every 5, 10 or 15 minutes. The power unit control combines simplified operations with effective results. Portable, lightweight mattress replacement system fits most standard medical beds. Detta inlägg skrevs av MNS 400 Alternating Pressure Relief System och har visats 3412 gånger.